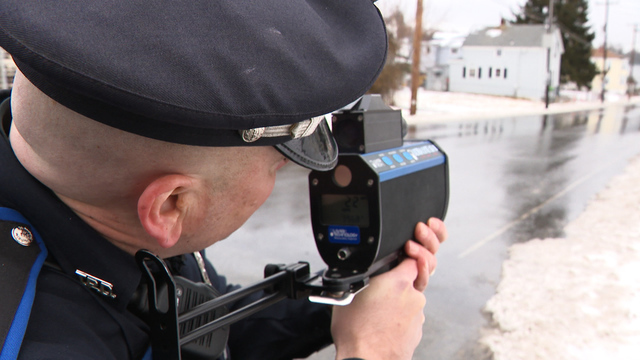 TIVERTON, R.I. (WPRI) — Most drivers get a bit nervous when a police officer approaches after aiming radar at their car. "Hello, sir," Officer John LeDuc said to one driver at a Tiverton stop sign. "Do you have time to talk with me?" LeDuc let that and every other driver know it was not mandatory for them to chat with him. But most did. "You don't have to stop, but would it be okay if I talk with you for a quick moment?" he asked Heather Bishop. Perhaps the option to keep going was a clue this wasn't a normal traffic stop, but several drivers acknowledged they were still a bit antsy as LeDuc approached after they parked nearby. "As you came up over the hill, you're going the speed limit. You have your seatbelt on," he told Bishop. "We just want to recognize you for your good driving." With that, he handed Bishop a box of chocolates and a gift card, prompting a smile. "Happy Valentine's Day," she said. 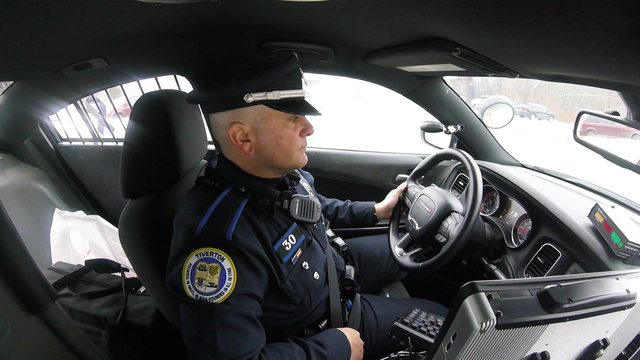 The fact that he normally delivers less than positive news to drivers is part of the thought process for the six-year police veteran and Marine. "I try to calm their fears," he said. "Let them know, by no means are they being reprimanded for anything." The idea of turning the tables on tickets came to LeDuc during much less pleasant traffic stops involving speeders, stop sign runners and other scofflaws. And there were a few of those during this kind crackdown. "You're going 11 miles over the speed limit and none of you are wearing a seatbelt," he told one driver. "I'm just going to warn you this time, but please drive safely." LeDuc said he and other officers do not enjoy ruining someone's drive with a citation. "After a while, it gets a little frustrating because it's always negative interactions we're having with the public," he said. So, LeDuc went to his chief and asked if he could reach out to local businesses to contribute gift cards and other goodies. 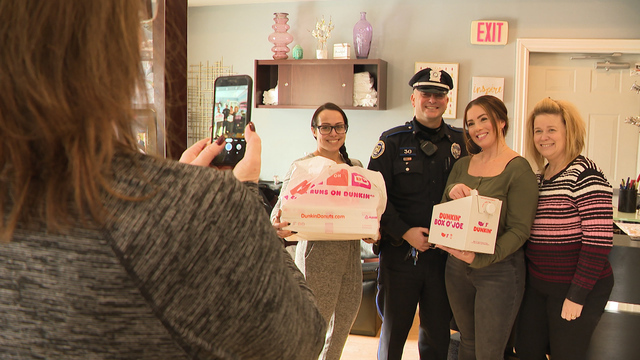 His chief said yes, and after a discussion about letting the good drivers know pulling over was optional, LeDuc was pleasantly surprised by the reaction of the nearly dozen businesses that chipped in. "The businesses in town want to be part of the community, and they want to be helpful in what we want to accomplish," LeDuc said. 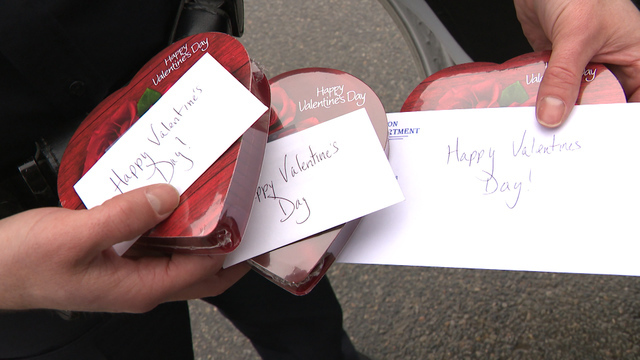 The day before Valentine's Day marked the third time LeDuc handed out positivity instead of citations, following the Fourth of July and Black Friday. But his department is pretty sure it won't be the last. Email Walt at wbuteau@wpri.com with your story ideas and follow us on Twitter: @StreetStories12 and @wbuteau.